When I was a kid I would get so excited if the bunch of bananas my mother brought home from the grocery store had a Chiquita Banana sticker. I’d quickly pluck it off the fruit and pat it proudly onto my shirt. Unfortunately these days my bananas always tend to go bad. Even so, I continue to buy them almost weekly, and inevitably after eating one from the bunch the rest sit on the counter until the skins turn. Then I either make banana bread, throw them out, or stash them in the freezer (well wrapped of course) until I feel the urge for muffins. Today when I noticed that my once perky yellow bunch had become a little too brown for for my taste I decided it was time to break out of the banana bread and muffin rut and update my overripe repertoire. A hunt for a recipe to use ensued and as per usual the internet didn’t let me down. This recipe yields a moist, fluffy, and sweet cake that goes perfectly with cream cheese frosting, while a dusting of chopped walnuts adds a nice crunch. Even though cake isn’t supposedly a suitable breakfast item I’m certain we’ll be sneaking bites with our morning pot of coffee. This recipe also proves that a “boring old sheet cake” can actually be mighty impressive if given the chance. 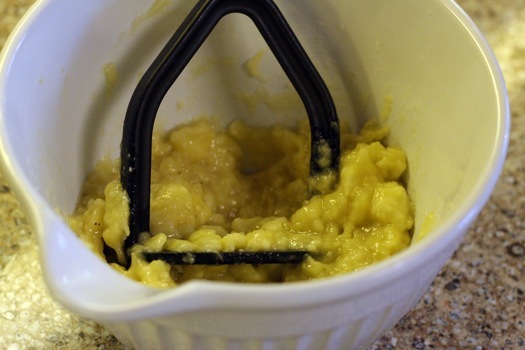 In a medium bowl, mix flour, baking soda, spices, and salt; set aside. 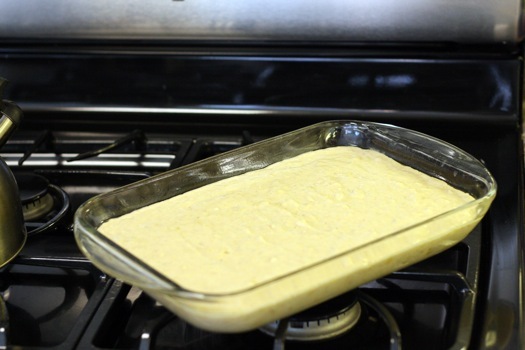 Pour batter into prepared pan and bake in preheated oven for one hour (Note: My cake took almost 90 minutes to bake) or until toothpick inserted in centre comes out clean. Spread on cooled cake. Sprinkle chopped walnuts over top of the frosting, if desired. 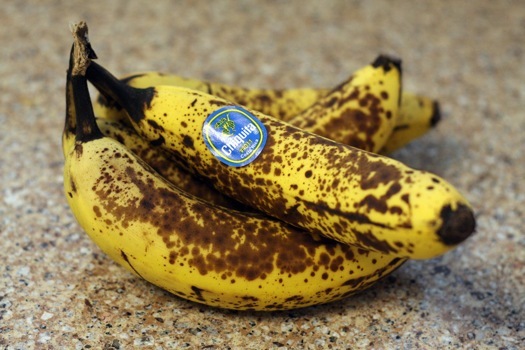 I have tried most anything with bananas that are aging. We try to eat them to get the potassium, but sometimes even in a brown bag in the fridge they just go on you. Bananas Forrester is on way that I try to use them, but you have now given us a new, and delicious, alternative. I lurrrve bananananas. You have inspired me, watch out Over Ripe Bananas. HERE I COME. 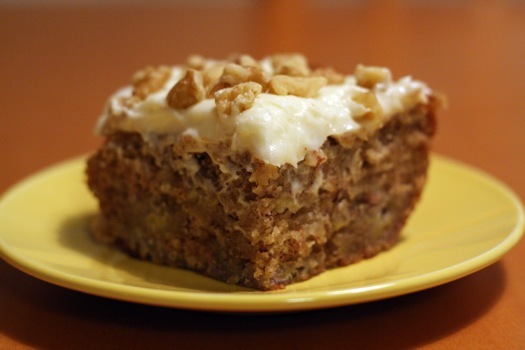 Mmmm…banana baked goods:) The cream cheese frosting puts this over-the-top delicious sounding. Terrific photo, too! I haven’t made Banana Cake with Cream Cheese frosting in SO long! Now I definitely need to let some bananas get overripe! I just found your blog through the blogher link. Such a cute design. I too freeze my ripe bananas, but sometimes forget about them…This looks like a great cake for morning (or afternoon) coffee. Maybe I’ll have to pull mine out of the freezer and make a banana bundt cake you’ve reminded me of. I’m the worst when it comes to preserving old bananas. I will buy a bunch hoping I’ll actually eat them all–yeah right. that never happens. your cake looks good! I had old brown bananas in my freezer and my hubby was like, what the heck? I said, just you wait and see. Well, I broke them out this past week and I wanted you to know that I made this cake. My son said that it really is the Best Ever Banana Cake! It was so moist and yummy! Thanks! Erin, this is simple and simply lovely. Of course, I’d probably have to eat the first batch of cream cheese frosting and make another to frost the cake – but that’s a good problem to have. Delicious! I tried this out last week and it was delicious! I added a coffee ice cream center… mmmm!! !